Here's a place it's hard to imagine God, but it is the place God often chose to be! Our friend had quadruple bypass surgery and his first hospital stay. Instead of parking in the ministers' reserved area and visiting the sick, he lay in an airy hospital gown and received visitors. Later, his sweet wife listed the kindnesses extended from hospital staff, family, and friends because many rallied to "bless" this godly couple. Their helpers bowed their knees to them, not in worship but in service. [God said to Abram,] "I will make you into a great nation and I will bless you; I will make your name great, and you will be a blessing. I will bless those who bless you, and whoever curses you I will curse; and all peoples on earth will be blessed through you" (Genesis 12:2-3). Once source* explains, "The idea of blessing may come from several factors including that of bending the knees to give or to receive." Both elements of giving and receiving are present in God's call to Abram. First, God bowed his knees and served Abram so Abram could accomplish God's will for his life. Eventually through Abram's lineage, God gifted the entire earth with Jesus Christ. Abram believed God's promises, used God's provisions, and bowed his knee in service to his family and foreigners. I easily imagine Abram bowing his knee to serve God and his contemporaries. However, I have difficulty when I picture God on his knees, serving Abram, not in worship but through the keeping of his promises to bless Abram. While the picture of God kneeling to serve might be difficult to visualize, testimonies of God's gracious service appear all through scripture. From the earliest days, God has served his creation and expressed his all-out love through provisions and justice. The Creator seeded the earth and set up an atmosphere to support plant life and humans. He didn't let Cain get away with murder. For thousands of years, God has nurtured humanity, yet we as humans have continued to ignore or bite the hand that feeds us. In addition, God planned a complete demonstration of his love through Jesus Christ — a demonstration of love that would impact us like nothing before or since. Ultimately, God let us view his servant heart through his Son Jesus, and his three year ministry held countless revelations of God's truth and grace (John 1:14-18). 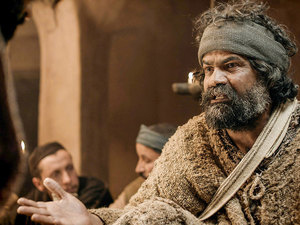 On the evening before his crucifixion, Jesus assured his disciples, "Anyone who has seen me has seen the Father" (John 14:9). Earlier that night, Jesus had demonstrated God-as-servant, showing his disciples the "full extent of his love" (John 13:1). When the Master Teacher had gathered to dine with his disciples in the upper room, street grime had come along on their feet. That's when the God of Abram, "found in appearance as a man" (Philippians 2:8), got up from the meal, took off his outer garment, and wrapped a towel around his waist. After pouring water into a basin, the God of Abram knelt, and one at a time he would lift and clean 24 dirty feet. Wash and dry. Wash and dry. Wash and dry. Thomas. John. Thaddeus. Andrew. James. Bartholomew. Peter. Judas. The cleansing wasn't brief: The meal stopped. It took time. 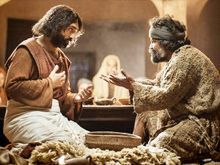 Minutes and more minutes ticked by as Jesus, found in appearance as a man, made himself nothing by taking the very nature of a servant (Philippians 2:6-8). Servant God knelt. Moved from man to man, foot to foot, and physically touched each disciple. 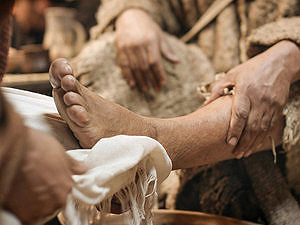 Dipping water from a basin, scrubbing toes, toweling ankles, Jesus humbled himself one more time before he "became obedient unto death-even death on a cross!" (Philippians 2:8). I'm ready for a new portrait. Jesus answered, "Unless I wash you, you have no part with me" (John 13:6-8). Later... the disciples comprehended. They remembered the night Jesus made himself of no reputation and took upon the form of a servant — the night he declared most of them were clean and set in motion a perpetual cleansing. They learned from God "found in appearance as a man" that protocol couldn't hinder lavish love. When Abram received his call, Servant God eventually furnished everything Abram needed to carry out the divine path for his life. Abram believed God and his belief equaled righteousness in God's court (Genesis 15:6). I find it easy to picture looking up into the heavens and praying to God. I can even clearly picture God at my side walking in a garden as we talk about life. However, the image blurs when I look down into the eyes of the God of Abram fashioned as a man washing my feet. I'm ready for a new portrait. I'm praying that God will place in my mind and heart the knowledge of a towel-draped Savior at my feet who will equip me to bless — bow my knees to others. "God at Our Feet" by Cathy Messecar is licensed under a Creative Commons License. Heartlight encourages you to share this material with others in church bulletins, personal emails, and other non-commercial uses. Please see our Usage Guidelines for more information.